Book Blurb – He hides in the shadows, waiting for the perfect moment. Each kill is calculated, planned and executed like clockwork. Well apart from telling you that it was a good read, and it was. I want to say lots and lots about the story but at the same time I want to say absolutely nothing. Nothing. Mouth – zipped. Nothing. For fear that I will give away any of the many potential spoilers. Her last move was filled with twists and turns, especially in the latter portion of the book. I was hooked. I stayed up hours past my usual bedtime, despite an early morning because I needed to know what was going to happen. And the ending didn’t disappoint. Personally, I always think that calling a book entertaining is high praise, because that is exactly what I want to be most of the time when I read. And with Her last move I was entertained from the beginning to the end – not a dull moment, not a boring chapter or character. In fact, I got quite attached to the characters and had to close the book for a moment, well, when…. spoiler! 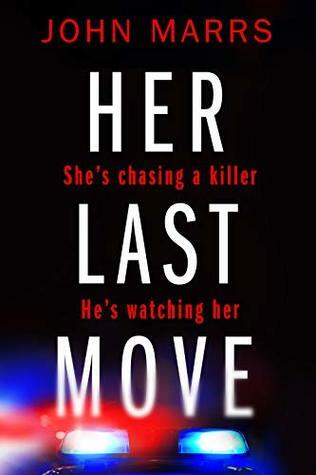 Her last move by John Marrs gets 4.5**** stars out of 5 from me. Recommended. This wasn’t my first John Marrs book, but it was my favourite so far…I am looking forward to picking up the next one. I have read great reviews about – The one. I loaned/subscribed (?) Her last move by John Marrs via my kindle unlimited subscription. I haven't yet dipped my toe into John Mars writing but he is definitely on my radar and this one sounds super appealing! It has been my favourite of his so far.